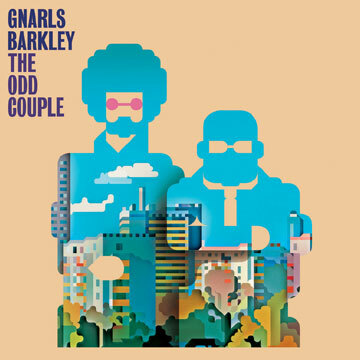 After much anticipation and speculation, Gnarls Barkley has provided information about the new album "THE ODD COUPLE", in stores worldwide on March 25th. "THE ODD COUPLE" explores the forbidden underworld of popular music and human psychology, starting at the intersection of pulsating hooks and pure emotion. "THE ODD COUPLE" is heralded by the full-tilt psychedelic soul stomper "Run", a leaked track that is now impacting heavily at radio. "Run" has been rushed to iTunes early, and a mind-bending music video is now in production, directed by the filmmaking team known as Happy. A video for the second single "Who’s Gonna Save My Soul" is being directed by Chris Milk, who helmed the band’s Grammy-nominated video for "Gone Daddy Gone." The band is commissioning an eclectic roster of emerging filmmakers to produce further clips - details will emerge soon. Gnarls - the Grammy-winning combination of artist and producer Danger Mouse and vocalist Cee-Lo Green - is indisputably a pivotal act of the 21st Century. The duo, famous for inventive, elaborate live performances, has begun to slate touring plans for 2008. Gnarls headlines the Hollywood Bowl on July 27, and will perform at a number of top-tier American and European summer festivals. The band will soon confirm a slew of TV appearances as well. The pop kaleidoscope "ST. ELSEWHERE" was a critical triumph and chart-topping blockbuster. At 2007’s 49th Annual Grammy Awards, Gnarls received seven nominations and snagged two of the event’s most coveted trophies - "Best Alternative Music Album" and "Best Urban Alternative Performance".